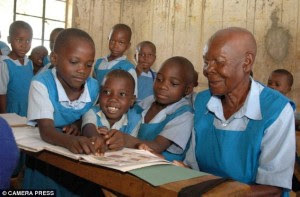 Ms Mariana Ololo, 78 years old has joined class one at Obambo primary school in western Kenya. She arrived at the school fully dressed in the school uniform and with a shaved head ready to study. Her 56 year old son is her guardian and accompanied her when she reported two weeks ago.Though her frail health remains a challenge, she is determined. 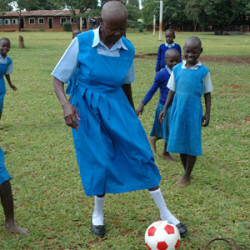 The teaching staff in the school had to meet to discuss her admission. The head teacher said that strategies had to be laid down on handling her, given her elderly status. Her five sons have all studied up to form four. One of them is a graphic designer based in Belgium and another is in South Africa pursuing a master’s degree. All the same, she wants her own bite of success and says she will stop at nothing to see her dreams come true.